The Hope Discipleship Group grants you access to everything on the site. You get free eBooks, audio downloads, Podcast transcripts, email training, and ALL the Bible and Theology courses (worth over $1000). Best of all, you get invited to join our Private Facebook Group for interaction, questions, and live video chats. 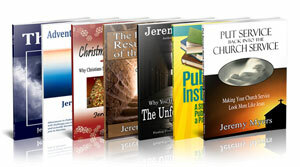 You receive all of this for one low annual gift to Jeremy Myers and RedeemingGod.com. Thank you for your support!